Proof allowed in Heather Capital case. A RULING in the latest hearing of the Heather Capital case by three judges at the Court of Session has granted proof hearings against law firms Levy & Mcrae and Burness Paul LLP. The decision is bound to be an uncomfortable one for Scotland’s senior judges as the case has direct links back to the judiciary itself, revealed when Lord President Lord Brian Gill was forced to suspend Sheriff Peter Black Watson after Watson was named in a writ launched by Heather Capital’s liquidator in early 2015. 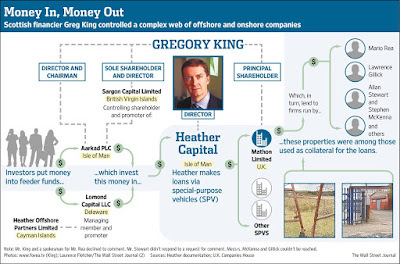 Heather Capital, run by Glasgow -born financier Greg King, raised £280million from investors but the fund collapsed in 2010. Current and ex Levy & McRae partners including suspended sheriff Peter Watson now face a claim of up to £28million from Heather’s liquidator Paul Duffy. Lord Doherty earlier ruled evidence should be heard to decide the case but Levy & Mcrae launched an appeal, which has now failed. Watson was listed in court papers as the “eighth defender”. In his ruling on July 22, Lord Doherty stated the allegations related to claims of “links between the eighth defender and companies controlled by Mr King”. It said the allegations were “that in December 2008 an unexplained payment of £200,000 was made to the eighth defender from the same client account into which £9.412million had been paid by” the Levy & McRae partners. Greg King, 48, is one of four men charged by police after the demise of Heather Capital’s lending arm Mathon Finance. It’s alleged £90million was stolen when Heather went bust. King, Andrew Sobolewski, 57, of Bridge of Weir, Renfrewshire, Andrew Millar, 63, of ­Cambuslang, near Glasgow, and Scott ­ Carmichael, 44, of Thorntonhall, near Glasgow, were named in the report on Mathon sent to the Crown Office. The Crown Office said the report is still “under consideration” nearly four years on from when Police Scotland first referring the case to the Lord Advocate. Sheriff Peter Watson was suspended from the office of part-time sheriff on 16 February 2015, in terms of section 34 of the Judiciary and Courts (Scotland) Act 2008. In these two actions raised in 2014, the liquidator of Heather Capital Limited (HC) sues two firms of solicitors, Levy & McRae (LM) and Burness Paull (BP). The grounds of action include implement of trust obligations, and damages for alleged breach of contract, negligence, breach of fiduciary duty and dishonest assistance. The solicitors contend that, on a proper construction of the liquidator’s own pleadings and without the need for evidence, it can be seen that certain obligations have been extinguished by the passage of time in terms of the Prescription and Limitation (Scotland) Act 1973. Those submissions were successful in the BP action (a debate before Lord Tyre), and partially successful in the LM action (a debate before Lord Doherty). The liquidator reclaimed. LM and BP cross‑appealed. The cases came before the Inner House on 15 and 16 November 2016. This opinion focuses upon obligations which are subject to the 5‑year prescriptive period and the effect on the running of that period of sections 11(3) and 6(4) of the 1973 Act. In a separate opinion (with which I agree) Lady Clark rejects an argument that there are insufficient relevant averments of any loss suffered by the pursuer (HC). While it is possible that losses which were easily identifiable by HC may have occurred in 2007, leading to the triggering of the 5‑year prescription in 2007 (i.e. more than five years before the actions were raised in 2014: see paragraphs  to  below), this is a matter of dispute which cannot be resolved on the pleadings alone. In any event, HC’s averments of reasonable diligence (ie section 11(3) of the 1973 Act) and of error induced by the solicitors (ie section 6(4), with the proviso of “reasonable diligence”) are, in my opinion, sufficient to entitle HC to a proof before answer in each case, all pleas standing: see paragraph  et seq below. As I have reached the view in each case that there should be a proof before answer at large, all pleas standing, I consider it unnecessary and premature for this court to give an opinion relating to the 20‑year prescription: see paragraph  below. As set out in the final paragraphs of this opinion, I propose that the court should recall the interlocutor of Lord Tyre dated 6 November 2015 and the interlocutor of Lord Doherty dated 31 August 2016; in each case allow a proof before answer at large, all pleas standing; remit to the Outer House to proceed as accords; and continue meantime the question of the expenses of the reclaiming motions. HC is an investment company incorporated in the Isle of Man in 2005. On 7 July 2010, as a result of difficult economic conditions and cash flow problems, a liquidator was appointed. In February 2011, the liquidator received electronic documentation, and began a detailed review of the company’s affairs. At a later stage, he was assisted by staff from the Fraud Investigations and Dispute Service in Ernst & Young LLP. In 2012, the liquidator and his team were able to confirm that millions of HC’s funds were missing in circumstances suggestive of a deliberate fraud perpetrated by HC’s two executive directors, Mr King and Mr Volpe. Details of the mechanism of the alleged fraud can be found in the Opinions of Lord Tyre,  CSOH 150, and Lord Doherty,  CSOH 107. As summarised in an Isle of Man judgment, the scheme resembled a “Ponzi” scheme in that apparent repayments to HC were in fact funded in a circular way by HC itself: see paragraph 30 of the judgment of His Honour Deemster Corlett, Heather Capital Limited v KPMG Audit LLC, 17 November 2015. A third party, Nicholas Levene, was a participant in the scheme. He is currently serving a 13‑year sentence for fraud, false accounting, and obtaining money by deception. To date, no proceedings have been taken against Mr King or Mr Volpe. Both actions are at the stage of debate. No evidence has been led. Accordingly allegations against particular individuals (for example, Mr King and Mr Volpe) have not been established. The liquidator seeks to recover and ingather funds. He has raised various court actions. The present actions in the Court of Session were raised on 23 October 2014 (with amendments to the instance in March/April 2015). Count and reckoning of BP’s intromissions from 1 March 2006 to 31 July 2006 with HC’s funds received into its client account, and payment of any balance due. Failing count and reckoning, for payment of £7.3 million. Alternatively for payment of £7.3 million. Alternatively for declarator that BP, through Mr Scott Wilson (then a partner), dishonestly assisted Mr King in committing breach of his fiduciary duties owed to HC and in diverting from HC £7.3 million. Count and reckoning of LM’s intromissions from 1 January 2007 to 30 June 2007 with HC’s funds received into their client account, and payment of any balance due. Failing count and reckoning, for payment of £28.412 million. Alternatively for payment by way of recompense of £28.412 million. Alternatively for payment by way of reparation of £28.412 million. Alternatively for declarator that LM dishonestly assisted Mr King in committing breach of his fiduciary duties owed to HC and in diverting from HC £28.412 million. The summons in each case was served on the defenders on 23 October 2014. Each summons was subsequently amended (in LM’s action on 27 March 2015, in BP’s action on 28 April 2015) such that the instance reads “HC and Paul Duffy” (rather than “Paul Duffy as liquidator of HC”). The BP case:17 April 2012, when the true destination of funds was confirmed by an e-mail from Scott Wilson, then a partner of BP. The LM case: 31 August 2012, when the true destination of funds was confirmed by the production of the client ledger under an order in terms of section 236 of the Insolvency Act 1986 (although senior counsel for HC also accepted that the earliest possible starting point for the five-year prescription was arguably February 2011, when the liquidator received the electronic documentation:see too Condescendence 39; and (paragraph  of Lord Doherty’s Opinion). Each summons was met with inter alia a plea of prescription. Lord Doherty granted leave to reclaim. The following abbreviated timeline is taken from HC’s averments, productions, and some undisputed parts of the Opinions of the Lords Ordinary. There were no joint minutes agreeing productions: counsel referred to and relied upon some productions without objection, and the court was invited to do likewise. Counsel chose to present the LM case before the BP case. However as the events concerning LM occurred after the events concerning BP, that chronological order is reflected in the timeline below. On 21 April 2006, HC transferred funds to its client account with BP.Loans to four first level SPVs, namely Bayhill, Brookhill, Hampsey and Bellwood, were anticipated and were recorded in HC’s books (Lord Tyre paragraphs ,  and ;Condescendence 5). On 24 April 2006, after an email bearing to be from Mr King but forwarded to Mr Scott Wilson of BP by John Caulfield, Mr Wilson transferred £3.3 million from the client account directly into Mr Levene’s personal account, not to any first level SPV (Condescendence 16-17; Lord Tyre paragraph ).In the email chain, Mr Levene indicated that he would use the funds for “our IPOs”. On 3 May 2006, Mr Wilson sent documentation for Bayhill, Brookhill and Hampsey to Mr Ashworth, managing director of Abacus (HC’s management and administrative services).Mr Wilson did not mention payment of the funds into Mr Levene’s personal bank account.Abacus recorded the loans in HC’s books of account as having been made to Bayhill, Brookhill, and Hampsey (Lord Tyre paragraph  and ). On 12 July 2006, Mr Wilson of BP transferred £4 million from the client account to a company Mathon plc.The Bellwood documentation was sent to Abacus.Mr Wilson did not mention payment of the funds into Mathon’s account.Abacus recorded the loan in HC’s books of account as made to Bellwood (Lord Tyre paragraphs ,  and ;Condescendence 24 et seq). In early 2007, HC’s auditors KPMG raised questions about what appeared in HC’s books of account as loans to first level SPVs (Bayhill, Brookhill, Hampsey, and Bellwood).KPMG identified concerns including (i) inability to reconcile second level SPVs’ heritable securities with the Land Registry;(ii) missing documentation;and (iii) concerns about the enforceability of securities given by second level SPVs (Lord Tyre, paragraph ). By a memorandum dated 17 March 2007, KPMG recorded these concerns and indicated that further work and information was required (Condescendence 5, page 8 of BP reclaiming print). In May and June 2007, amounts equivalent to loans thought to have been made to the four SPVs were apparently “repaid” to HC via Cannons, solicitors, Glasgow (Lord Tyre paragraph  et seq;Condescendence 27A and 27B). KPMG carried out additional work, including a “full scope audit to 30 September 2007 to gain greater assurance over receipt of monies in relation to the SPV loans and their subsequent reinvestment” and “an audit of the nine month figures to 30 September 2007” (Lord Tyre paragraph ). By letter dated 26 November 2007, Mr King advised the board of HC that “some sort of fraud had been deliberately introduced with invalid land registry details on a number of the loans”.He stated that he had applied pressure to Mr Volpe and Mr Cannon, whereupon there had been “full repayment of the loans with relevant interest” which meant that “investors were secure” (Lord Tyre paragraph ). On 4 December 2007, HC obtained legal advice from Bird Semple regarding the apparent repayment of the SPV loans (Condescendence 5, page 9 of BP reclaiming print). By email dated 12 December 2007, Mr King supplied apparently fabricated correspondence supporting his account of the repayment of the first level SPV loans to HC (Condescendence 5, page 9 of BP reclaiming print). In December 2007, having examined HC’s books, the auditors KPMG expressed concerns, using language such as “the risk of fraud increased to high”, “some form of fraud appeared to have been attempted”, “increase[ed] audit procedures” and a statement that “We have been unable to verify where funds advanced to the SPVs were invested.In addition, we were supplied with false documentation in relation to the SPVs, which appears to have been a deliberate attempt to mislead us” (Condescendence 5, pages 9-11 of BP reclaiming print;Lord Tyre paragraph ). On 6 June 2008, KPMG signed their audit report with qualifications concerning the SPV loans (Condescendence 5, page 12 of BP reclaiming print). On 5 September 2008 and 12 May 2009, KPMG signed the accounts reports without audit qualifications (Condescendence 5, page 12 of BP reclaiming print). On 7 July 2010, the liquidator was appointed to HC (Condescendence 1). On 6 June 2008, KPMG signed their audit report with qualifications concerning the SPV loans (Lord Doherty paragraph ). On 5 September 2008 and 12 May 2009, KPMG signed the accounts reports without audit qualifications (Lord Doherty paragraph ). In 2009, the Serious Fraud Office in England and Wales opened an inquiry into Mr Levene’s business affairs.He was subsequently charged with fraud and pled guilty (Condescendence 4). On 5 November 2012, Mr Levene was sentenced to 13 years imprisonment (Condescendence 4). Senior counsel’s submissions relating to the 5‑year prescription and sections 11(3) and 6(4) are noted below, in an abbreviated and paraphrased form. Lord Davidson QC submitted that HC’s averments were sufficient to engage section 11(3); Lord Doherty’s approach to section 6(4) should be preferred to Lord Tyre’s; BP and LM erred in their cross‑appeals in contending that HC’s averments disclosed (i) actual knowledge on the part of HC; and (ii) in the BP case, imputed knowledge on the part of HC via one of its directors (Volpe). They also erred in their assertion that, on HC’s averments, there had been no conduct on the part of BP and LM qualifying within section 6(4). In the result, each action should go to a proof before answer, all pleas standing (Jamieson v Jamieson 1952 SC (HL) 44). It was neither necessary nor appropriate to plead evidence (John Doyle Construction Ltd v Laing Management (Scotland) Ltd 2004 SC 713 at pages 722‑723; Court of Session Practice Note No 6 of 2004 (Commercial Actions) paragraph 3(1); Watson v Greater Glasgow Health Board  CSOH 93 at paragraphs 22‑23). HC averred sufficient reasonable diligence, including examining all avenues; involving accountants; complaining to criminal authorities and regulators; and investigations by non‑executive directors. Evidence likely to be led was set out in an appendix to HC’s Note of Argument. Mr King had concealed the true fraudulent scheme by his diversionary “cover story” involving Mr Volpe and possible fraud at the second level SPVs. But the level of reasonable diligence required was no higher because HC had been warned of an element of fraud. The liquidator was appointed in 2010. He received the documents electronically in February 2011, and began to examine them. It took expert accountants and regulatory authorities such as the FCU considerable time to work out what had happened. Standing the complexity of matters, the difficulties being experienced by accountants and regulators, and the fictional fraud actively propagated by Mr King, it could not be suggested that the non‑executive directors of HC should have uncovered matters more promptly. The auditors’ letter of 4 January 2008 had been taken out of context and given too much weight. Both Lords Ordinary had gone too far too fast. The BP pleadings had been amended following upon the debate before Lord Tyre, in particular enhancing the averments relating to reasonable diligence, which were now in effect common to both actions. Both BP and LM were entitled to proof, standing authorities such as Peco Arts Inc v Hazlitt Gallery  1 WLR 1315 at page 1323, and Glasper v Rodger 1996 SLT 44 at page 48. Nothing in HC’s pleadings or the productions demonstrated that HC was aware that it had suffered loss. Senior counsel referred inter alia to the auditors’ qualifications and caveats in HC’s accounts; Mr Bourbon’s email of 28 March 2008; Mr McGarry of KPMG’s interview with the FSA; and KPMG’s sign‑off letter dated 28 May 2008. The averments relating to awareness and reasonable diligence were sufficient for a proof before answer. Lord Doherty’s reasoning was to be preferred. “Conduct” included an omission or silence. In addition, in the BP case, Mr Wilson of BP had sent Abacus (HC’s administrator) the formal documentation relating to Bayhill, Brookhill, Hampsey and Bellwood, as if the transactions had been successfully completed. That was a positive action, in addition to silence. As for onus, once HC established error induced, the onus shifted to the defender to prove the proviso in section 6(4): paragraph  of Graham v E A Bell & Co (Lord Hardie, unreported, 24 March 2000). The averments relating to section 6(4) were sufficient for a proof before answer. Awareness of Mr King’s cover story did not amount to awareness of the real loss. Neither the letter of 4 January 2008, nor the settlement of the liquidator’s action against the non-executive directors, demonstrated an awareness of loss. HC’s response to any argument based on Gordon’s Trs v Campbell Riddell Breeze Paterson LLP 2016 SLT 580 was as follows: (i) HC had not paid for the auditors’ additional investigative work (a feeder company, Sargon, paid); (ii) no causal link between the defenders’ conduct and the alleged losses existed: HC had not sued the defenders in respect of any investigative expenditure, and that expenditure was unconnected to any breaches of duty on the part of the defenders: it was part of Mr King’s cover story. In the result, HC had been unaware of any loss until after the appointment of the liquidator. BP had knowledge of the Bayhill, Brookhill, Hampsey and Bellwood transactions, but not of the WBP transaction. BP’s knowledge was therefore irrelevant in the LM case. In any event, BP’s knowledge should not be imputed to HC (Lord Hoffmann at pages 703e to 704a of El Ajou v Dollar Land Holdings plc  2 All ER 685). Mr Volpe was a co‑conspirator (Condescendence 5). The knowledge of a criminal director should not be imputed to the company (Bilta (UK) Ltd v Nazir (No 2)  AC 1, Lord Neuberger paragraph ). In conclusion, senior counsel submitted that both actions should be sent to a proof before answer, all pleas standing. Mr Duncan QC for LM submitted that the liquidator’s reclaiming motion should be refused, and LM’s cross‑appeal allowed. Lord Doherty’s interlocutor of 31 August 2016 should be recalled, LM’s pleas‑in‑law 1, 2 and 6 sustained, and absolvitor granted (or alternatively if the “no loss” submission succeeded, dismissal). The 5‑year period began to run when HC was aware that it had suffered a loss (Morrison & Co Ltd v ICL Plastics Ltd 2014 SC (UKSC) 222). A loss was suffered when a loan was made and inadequate (or no) security was given in return. It was irrelevant whether or not the loss might subsequently be reversed (Jackson v Clydesdale Bank plc 2003 SLT 273 paragraphs  to ; Heather Capital Limited v Burness Paull LLP  CSOH 15 paragraph ). When Mr King referred to “some sort of fraud” on 26 November 2007, HC was inevitably aware that it had suffered a loss in that it had advanced funds to an unknown and/or unsuitable borrower in circumstances suggestive of fraud, for an unknown purpose, without adequate security, and with an unverifiable destination for the funds (cf the earlier email dated 7 September 2007 from Mr McGarry of KPMG). Further, the auditors’ letter dated 4 January 2008 unequivocally advised HC that it had suffered a loss. The extent of the non-executive directors’ knowledge by that time was as detailed in the defence to the liquidator’s Isle of Man action against them. Lord Doherty erred in accepting that there was a distinction between fraud at first level SPVs and fraud at second level SPVs, as the first level SPVs were shell companies with no assets, and security for the loans came from the heritable securities granted by the second level SPVs. In any event, HC had been obliged to incur additional cost and expense as a result of learning about the disappearance of the funds. HC had to instruct its auditors to do extra work; pay for a non‑executive director’s trip to Gibraltar to try to obtain information from Triay & Triay; instruct a legal opinion from Bird Semple, solicitors, about the apparent repayments. Those additional costs or liabilities were clearly known to HC, and they triggered the 5‑year prescription even if they might not have appeared to be a loss at the time (Gordon’s Trs v Campbell Riddell Breeze Paterson LLP 2016 SLT 580). Lord Doherty was correct to exclude any reference to section 11(3). The auditors had urged HC to make investigations (for example, Mr McGarry’s email of 7 September 2007). The FSC had given similar advice (FSC’s letter dated 18 October 2007). The non-executive directors were told to find out “where the money went when it left HC”. In those circumstances, clear and specific averments of steps taken by HC were required before section 11(3) could be invoked (Beveridge & Kellas WS v Abercromby 1997 SC 88; Heather Capital Limited v Burness Paull LLP  CSOH 150, paragraph ). The lack of averment as to why inquiries had been made of Triay & Triay, solicitors, and Cannons, solicitors, but not of Burness Paull, solicitors (who acted in 4 out of the 12 transactions) whose partner Mr Scott Wilson would readily have disclosed the necessary information – in particular the destination of the funds – was fatal to HC’s case. BP was not questioned until 2012. HC’s averments in Condescendence 39 disclosed that £28.412 million had been “paid out to third parties, about whom no, or no proper, enquiries had been made, undocumented, and without security”. Why had HC not asked LM and BP where the money had gone? Bank records would have disclosed this. The auditors told the non‑executive directors that they must find out where the money went. But the solicitors were not asked. HC had been put on major alert (Answer 39), and yet had not made basic inquiries. LM did not rely on Mr Volpe’s knowledge, but on BP’s (as HC’s agents). That knowledge was to be imputed to HC, regardless of whether or not BP in fact communicated it (Chapelcroft Limited v Invergordon Egg Producers Limited 1973 SLT (Notes) 37; Adams v Thorntons WS (No 3) 2005 1 SC 30; Blackburn Low & Co v Vigors (1887) 12 App Cas 531; Muir’s Exrs v Craig’s Trs 1913 SC 349; Johnston, Prescription and Limitation (2nd ed) at paragraph 6.89). On HC’s own averments in the action against BP, that knowledge would have led to their detecting and preventing the alleged fraud months before LM were instructed. Conclusion: In conclusion, Lord Doherty had been right to conclude that section 11(3) of the 1970 Act could not assist HC. Mr Duncan QC submitted that the onus of establishing reasonable diligence in terms of the proviso to section 6(4) lay on HC: cf Lord Penrose in paragraph 36 of Adams v Thorntons WS 2005 1 SC 30; Lord Hope in BP Exploration Operating Co Ltd v Chevron Transport (Scotland) 2002 SC (HL) 19. Lord Doherty’s contrary opinion (that the onus lay on LM) placed too much weight on an obiter observation of Lord Millett in the BP Exploration case (an observation not taken up by either Lord Hope or Lord Clyde) and relied on too narrow a reading of the dicta of Lord Penrose in Adams v Thorntons WS 2005 1 SC 30. The onus lay squarely on HC. In their pleadings, HC focused on two alleged errors induced, namely (i) error as to the destination of the funds and (ii) error in being kept in ignorance of a possible claim against LM. However in relation to (i) while HC might have been under the erroneous misapprehension that the funds in question were destined for a particular first level SPV Westernbrook Properties Ltd (WBP) (Lord Doherty’s Opinion paragraph ), HC was disabused of that misapprehension by the letter of 4 January 2008 from its auditors KPMG, giving clear written advice to the effect that nothing could be verified about where the funds had gone; the source of the purported repayments was unknown; and further investigations were required. (ii) As for the second alleged error, that presupposed the existence of a duty to confess or a duty to tell on the part of LM: but there was no authority for such an alleged duty (Maharaj v Johnson  PNLR 27; Bell v Peter Browne & Co  2 QB 495). If such a duty existed, the underlying cause of action would never prescribe. In any event, the directors had the necessary knowledge by January 2008. Thus the attempt to invoke section 6(4) failed. Also the attempt to invoke the proviso to section 6(4) failed as HC could not demonstrate reasonable diligence (cf paragraph  above). Lord Doherty was correct to exclude the averments relating to section 11(3), but had otherwise erred in the context of the short negative prescription. The interlocutor of 31 August 2016 should be recalled; LM’s sixth plea‑in‑law should be sustained to the effect that the defenders should be assoilzied from any claim for breach of contract, fault or negligence or assistance or fraud. Mr Dunlop QC for BP adopted Mr Duncan’s submissions. Further, he submitted that there was a concurrence of injuria and damnum in 2006, as the payments were made in 2006 (Dunlop v McGowans 1980 SC(HL)73). Yet the action against BP was not raised until October 2014 (with an amendment to the instance in the spring of 2015). Thus HC’s claims so far as directed to breach of contract, reparation, negligence, and dishonest assistance were extinguished by prescription in terms of section 6 and Schedule 1 of the 1973 Act, unless sections 11(3) and 6(4) applied. Mr Volpe was aware of everything. As the averments concerning his complicity were inadequate, HC could not rely upon the dicta of Lord Neuberger in Bilta (UK) Ltd v Nazir (No 2) 2016 AC 1. HC was accordingly fixed with the relevant knowledge via Mr Volpe (Condescendence 5 at page 8B of BP reclaiming print; Condescendence 16 at page 26; Condescendence 20 at page 29). Esto the court took a different view, Mr Dunlop submitted that everyone at HC knew that BP had actioned the payments. It would have been an easy matter to ask BP where the money had gone. In early December 2007 the auditors told HC that there was a problem. It was irrelevant that repayments were apparently made in May‑June 2007, or that Mr King told the board a cover story in November 2007. Injuria met damnum in 2006, and the 5‑year period began to run. For section 11(3) to assist HC, HC had to demonstrate an excusable state of ignorance in 2009‑2010: but they could not do so. HC knew that BP had actioned the payments. When Scott Wilson, the banking partner of BP, was eventually asked in 2012 “to whom did you send the money”, he immediately and truthfully advised that he had sent the money to the destination he was told to send it, and gave full information. Had the question been asked earlier, the information would have been forthcoming. Against that background HC had not averred sufficient reason for the application of section 11(3). Mr Dunlop submitted that it was for HC to establish an error induced by BP. HC could not rely upon Mr King’s cover-up. On the averments, HC were advised by KPMG in 2007 that there was a problem. It was irrelevant that documentation had been sent to Abacus in 2006; or that in May‑June 2007 apparent repayments had been made; or that in November 2007 Mr King told HC’s board a misleading cover story. HC could not claim that any error on their part had been induced by BP: to do so would require a principle in law that the 5‑year prescription would not start to run until the solicitor ex proprio motu volunteered information about where the money had been sent. But there was no authority for such a proposition. Lord Doherty was correct in his statement of the law in Trustees of Rex Proctor & Partners Retirement Benefits Scheme  CSOH 83 at paragraph  and Lord Tyre was correct to agree with him on that matter; see too Maharaj v Johnson  PNLR 27. As for the proviso to section 6(4), i.e. demonstrating reasonable diligence in discovering where the money went, HC could not satisfy that test for the same reasons as those relating to section 11(3). On the averments, therefore, HC was unable to pray in aid section 6(4). Lord Tyre had not erred. The court should adhere to his interlocutor of 6 November 2015. Inter alia, senior counsel pointed out that HC had not averred that it had suffered loss by incurring extra investigative costs as a result of any breach of duty on the part of the defenders (contrast with the circumstances in Gordon’s Trs v Campbell Riddell Breeze Paterson LLP 2016 SLT 580). The ratio in Gordon’s Trs could not therefore assist the defenders. The actions were raised in 2014. As noted in paragraph  above, HC avers that the date of “actual knowledge of loss” was 17 April 2012 (in the BP case) and 31 August 2012 (in the LM case). Nevertheless, it is not disputed that, as a matter of law, damnum met injuria when large amounts of HC’s investment funds were diverted away from their proper destinations into unknown hands for unknown purposes for a period of time. As senior counsel for LM submitted, in the context of a claim by a lender, loss is suffered when the lender advances funds and receives in exchange a bundle of rights less valuable than that which was anticipated, typically by reason of a defective or inadequate security. The prospect that the borrower might nevertheless repay notwithstanding the lack of security does not prevent the loss being suffered. Thus, on a proper application of the 5‑year prescription to the undisputed facts, and subject to section 11(3), the terminus a quo was agreed by counsel to be 2006 in the BP case (Lord Tyre, paragraph 21) and 2007 in the LM case (Lord Doherty, paragraphs 14 and 32). In those circumstances, senior counsel for HC accepted that the burden lay upon HC to aver, and in due course establish, that HC had brought itself within the terms of section 11(3). LM and BP contended that HC was given “unequivocal advice that it had suffered loss” more than 5 years before the raising of the actions. HC in its pleadings denies having been given such advice. Even if we take into account the terms of the email of 7 September 2007 and/or the letter of 4 January 2008, and indeed any other production to which we were referred (as distinct from the averments or any documents agreed by parties), whether individually or taken together, we are not persuaded that we can be satisfied that HC was unequivocally advised more than five years before raising the actions that it had suffered loss. We accept that HC’s averments are to the effect that HC was given repeated warnings that a very serious situation had arisen; that there had been questionable activities and unknown uses of the company’s investment funds during a period when the monies could not be traced, which “could lead to material loss”; and that further investigation by the company should be carried out. But it could equally be argued that HC was not in fact, and could not with reasonable diligence have been, aware of any loss to the company until the liquidator and his team managed to disentangle matters and to identify a loss of millions of pounds that HC had indeed suffered. Much may depend upon the evidence adduced in relation to these matters. However even if HC can establish that it was not aware, and could not with reasonable diligence have been aware, of any loss represented by the diversion of the company’s funds, such an argument might be fatally undermined by HC’s averments appearing to acknowledge that, in 2006 and 2007, HC incurred liability for costs which would not otherwise have been incurred but for the questionable events of those years. In particular, on HC’s averments as they stand, it can be seen that HC appears to have incurred liability for (i) fees charged by the auditors KPMG in respect of additional work (including, for example, a special full scope audit; a special nine month audit; and Mr McGarry of KPMG conducting a long interview with the solicitor Mr Cannon); (ii) the costs of a non‑executive director’s (Mr Bourbon’s) investigative trip to Gibraltar to interview Triay & Triay about the suspicious events; and (iii) the liability incurred in respect of the legal opinion obtained from Bird Semple on the question whether the apparent “repayments” could be treated as such, without the risk of being claimed by a third party on the basis of a constructive trust. Applying the recent guidance given by the Supreme Court in Morrison & Co Ltd v ICL Plastics Ltd 2014 SC (UKSC) 222 (as was done in Gordon’s Trs v Campbell Riddell Breeze Paterson LLP 2016 SLT 580), it is the defenders’ contention that HC’s pleadings in both the LM case and the BP case disclose HC’s awareness in 2007 of those costs (or one or other of them). The defenders submit that, as the law currently stands, it is irrelevant that such expenditure might not have been seen by HC’s non‑executive directors as a “loss” at the time. It is also irrelevant that HC has not claimed damages for such losses in the present actions: the averments relating to these apparent additional costs are on record, and in the context of prescription, they prima facie disclose liability for those losses being incurred by HC. Nevertheless senior counsel for HC disputed the correctness of such an approach: see paragraphs  and  above. It was said that another party had paid the cost of additional investigative audit work. It was contended that the costs were not being sued for, and were not considered to be costs or expenses arising from any breach of duty on the part of the current defenders. Thus it was submitted that HC had not suffered any such loss in 2007. In my opinion, this disputed issue calls for a proof before answer on the question of any loss suffered by HC as a result of any additional costs and outlays incurred in 2007. If, after evidence and submissions, it is established that HC did indeed incur costs or outlays in 2007 which would qualify as “loss” caused by any breach on the part of the defenders, and if it is established that HC was aware of those costs, the averments in Condescendence 5 to the effect that HC “could not with reasonable diligence have been aware that loss … had occurred” would appear to be of little assistance to HC. An element of HC’s loss would be the otherwise unnecessary expenditure referred to above, of which HC was presumably fully aware in 2007. Applying Morrison and Gordon’s Trs, it would arguably be irrelevant that the main bulk of HC’s loss was only discovered some years later (in 2012, or at the earliest, February 2011). The fairness or unfairness of such an approach might be a matter for debate (cf dicta of Lord Malcolm in Gordon’s Trs, paragraphs  to ; Scottish Law Commission Discussion Paper on Prescription No 160, February 2016, Chapters 3 to 5, and in particular paragraphs 3.17 and 4.21; Johnston, Prescription and Limitation (2nd ed) paragraph 6.94, final paragraph). But it is a matter requiring exploration of both facts and law before any final view can be formed. An erroneous assumption that solicitors would act in accordance with their normal professional standards and practices, and would not, for example, send a client’s funds to a third party who was not the intended recipient in the transaction, about whom little was known, without any clearcommercial rationale, without adequate documentation and security, and without intimating to the client that the funds had in fact been paid to someone other than the expected recipient (with whom all the formal documentation and security had been completed). An erroneous assumption that the relevant funds had indeed been paid to the appropriate first level SPVs (an assumption not necessarily contradicted by the auditors’ reports of problems in 2007, as the auditors were focusing upon the discrepancies and lack of documentation at the second level SPVs). An erroneous conclusion that HC appeared to have suffered no significant loss as a result of the funds being untraceable for a period, followed by the apparent repayment of the funds or their equivalent, with interest. HC’s conclusion (based to some extent upon the errors outlined above) that all relevant avenues of investigation appropriate to an investment company such as HC had been pursued, and that it was neither necessary nor profitable for HC to investigate further, or to try to ascertain exactly what had happened. HC’s lack of awareness that it might have a claim against its own solicitors BP and LM (cf Johnston, Prescription and Limitation (2nd ed) paragraph 6.108, second paragraph). “Conduct” is not defined in the 1973 Act. The approach to section 6(4) adopted by the courts suggests that the word should not be construed in a narrow or restrictive way: see for example Lord Hope (paragraphs  to ), Lord Clyde (paragraphs  to ), and Lord Millett (paragraph ) in BP Exploration Operating Co Ltd v Chevron Transport (Scotland) 2002 SC (HL) 19; Lord Drummond Young at paragraph  of Dryburgh v Scotts Media Tax Ltd 2014 SC 651; Lord Penrose at paragraph  seriatim in Adams v Thorntons WS 2005 SC 30; Lord Emslie at paragraphs  to  of ANM Group Ltd v Gilcomston North Ltd 2008 SLT 835; Lord Doherty at paragraphs  to  of Heather Capital Limited v Levy & McRae  CSOH 107; and Johnston, Prescription and Limitation (2nd ed) paragraph 6.108. Adopting that approach, it is my opinion that relevant conduct in the context of prescription may be active or passive. It may involve positive action, but equally, in certain circumstances, it may involve a silence or a lack of action. The conduct need not be deliberate, or blameworthy, or careless, or be carried out with any particular motive such as deception or concealment: Lord Emslie in ANM Group Ltd cit sup, paragraph ; Johnston, paragraph 6.124. The conduct does not have to constitute a crime or a breach of duty (whether contractual or delictual or fiduciary): Johnston, paragraph 6.108, fourth paragraph. The conduct does not require to be the sole cause of the error: Lord Emslie in ANM Group Ltd, paragraph ; Johnston, paragraph 6.107, second bullet point. It follows from the above that the relevant question, in my opinion, is simply whether any conduct on the part of the solicitors concerned, viewed objectively, induced or contributed to inducing some or all of the error as defined above, with the result that HC refrained (in the broad sense explained in BP Exploration) from making any claim against the solicitors. On a proper construction of HC’s pleadings, and for the reasons set out in paragraphs  to  below, I consider that there are sufficient relevant averments of error induced by the conduct of BP, entitling HC to a proof before answer on the question of the suspension of the 5‑year period in terms of section 6(4). I also consider that there are sufficient relevant averments of error induced by the conduct of LM, entitling HC to a proof before answer on the question of the suspension of the 5‑year period in terms of section 6(4). In the BP case, the averments are to the effect that HC erroneously assumed that the funds had been properly and regularly transferred to the intended recipients namely Bayhill, Brookhill, Hampsey and Bellwood, with all the necessary formal documentation such as debentures duly completed and delivered. HC’s position is that BP’s conduct contributed to that erroneous assumption, as on the averments BP gave HC no indication that the funds had, unexpectedly, been transferred to other destinations, unaccompanied by the necessary documentation or security. Even if BP themselves were tricked or misled into such actions by Mr King or Mr Volpe or anyone on their behalf, and even if BP thought that they were properly carrying out clear instructions from an appropriate source, it is in my opinion arguable, depending on what facts are proved, that BP’s own conduct induced, or contributed to inducing, the error on the part of HC. It will be seen that it is my opinion that silence on the part of BP, or their lack of intimation to or communication with HC (ie not telling HC that the funds had in fact been transferred to destinations other than the intended recipients) could qualify as “conduct” inducing error on the part of HC, as defined in paragraph  above. Furthermore in the BP case, there was an additional factor: it is averred that Mr Wilson of BP sent the completed formal documentation relating to Bayhill, Brookhill, Hampsey and Bellwood to Abacus, HC’s administrator, as if all had gone well and the transactions with the four first level SPVs (Bayhill, Brookhill, Hampsey and Bellwood), had been successfully and properly carried out, leaving HC in possession of appropriate documentation and security. If established as a fact, that would amount to a positive act, and if that act contributed to HC’s error, it would be a relevant factor in terms of section 6(4). In the LM case, the observations and conclusions in paragraphs  to  above apply, mutatis mutandis, but without the additional positive act of sending the completed formal documentation to Abacus. I also agree with and adopt the reasoning of Lord Doherty in paragraphs  et seq of Heather Capital Limited v Levy & McRae  CSOH 107. In the result, it is my opinion that it cannot be said in either case, on the basis of HC’s averments, that HC is bound to fail when seeking to rely upon section 6(4) (the test set out in Jamieson v Jamieson 1952 SC (HL) 44). The question of reasonable diligence on the part of HC remains a live issue, certainly in the context of the proviso to section 6(4), but possibly also in the context of section 11(3), depending upon the answer to the question whether HC suffered any loss as a result of additional costs and outlays incurred in 2007 (see paragraph  above). That approach was adopted by Lord President Hope in Glasper v Rodger 1996 SLT 44 at page 48; see too Johnston, Prescription and Limitation (2nd ed) paragraph 6.100 et seq. Accordingly the relevant question is: what was reasonable for HC and its directors in the particular circumstances of the case? “39 … the auditors had informed the relevant board of directors of HC that no loss had occurred and confirmed the position in subsequent years. In my opinion, the averments in each action (which seek to record a complex factual situation) are, in the particular circumstances of each case, sufficient for a proof before answer on the question of reasonable diligence. The context is that of prudent company directors whose primary purpose was to operate a profitable commercial concern. It is at least arguable that their paramount goals and duties in the circumstances were to ascertain whether the company had suffered an actual identifiable loss; to attempt as best they could (with the assistance of their auditors) to understand what had happened, particularly with a view to preventing repetition; to reorganise staff and procedures as necessary to avoid repetition; to continue running the business of the company with a view to making profits; and to report any questionable or apparently criminal or fraudulent activities to the appropriate public authorities such as the Isle of Man Financial Services Commission (FSC) and the Isle of Man Financial Crime Unit (FCU). While some might adopt the position that the directors could and should have followed the advice given in Mr McGarry’s email of 7 September 2007 (thus devoting staff and resources to obtaining “all possible evidence regarding the movement of monies out of Heather Capital into these SPVs and onwards to whatever purpose the funds were applied – ie sight of bank statements, payment/remittance instructions, certified extracts from solicitors clients’ money accounts etc”), it is at least arguable that in circumstances where no significant loss to HC had apparently been identified, the advisability of devoting significant company time and resources to the company’s own investigations with a view to ascertaining with greater certainty what had occurred had to be weighed against the company’s primary purpose, namely the making of profits for its investors and shareholders. When weighing up these matters, it must be remembered that HC and its directors are averred to have been actively misled by their own executive director Mr King, whom on the averments they had no reason to distrust. Furthermore, as averred, the auditors’ focus was upon problems at the second level SPVs, and not upon any apparent diversion of funds at the first level SPVs. Against that background, HC had to assess whether and to what extent the resources of a commercial investment company should properly be devoted to what appeared to be an open-ended investigation of some complexity. In this context, I consider that it is instructive to note that the liquidator, assisted by a team from the Fraud Investigations and Dispute Service in Ernst & Young LLP, did not discover certain critical facts about what had happened to HC’s funds until 2012. In the result, it is my opinion that sufficient has been averred to entitle HC to a proof before answer on the question of reasonable diligence. I therefore agree with the conclusion reached by Lord Doherty. Questions of onus in respect of the proviso to section 6(4) are best addressed once evidence has been led (cf Johnston, Prescription and Limitation (2nd ed) paragraphs 6.109 to 6.110; Lord Hardie at paragraph  of Graham v Bell, 24 March 2000 (unreported), referring to a shifting onus, depending on the evidence). As a proof before answer at large is required, any question of imputed knowledge would also, in my opinion, be more appropriately addressed once evidence has been led. In the light of the possible significance of any additional costs and expenses incurred by HC in 2007 (paragraphs  to  above), it might be thought that a preliminary proof before answer on that issue would be an expeditious way forward. However there remain live issues in relation to section 6(4) and the question of reasonable diligence: the wording of section 6(4) is such that it is unaffected by the ratio in Morrison & Co Ltd v ICL Plastics Ltd 2014 SC (UKSC) 222, in that for the purposes of assessing error induced in terms of that subsection it is relevant that the creditor has been left “entirely unaware that he might have a claim [against a particular person], and he had never so much as considered claiming” (cf Thorn EMI Ltd v Taylor Woodrow Industrial Estates Ltd, Lord Murray, 29 October 1982, unreported, approved in BP Exploration, 2002 SC (HL) 19 at paragraph , and referred to in Johnston, Prescription and Limitation (2nd ed) paragraph 6.108 second paragraph). Thus even if the defenders succeed in relation to section 11(3), it seems to me that the issues concerning section 6(4) and its proviso of reasonable diligence would require to be explored: and those issues cover much of the material in the case. Similarly it is my opinion that a proof on the issue of prescription alone, possibly (depending on the initial outcome) followed by a proof before answer on the merits, would result in an unwelcome duplication of evidence and expense. On the view which I have reached, I consider that it would be premature and inappropriate to explore any trust issues at this stage, prior to a proof before answer. If the 20‑year prescription applies to a trust obligation, such a trust obligation has not yet been extinguished by prescription. If any trust obligation is affected by the 5-year prescription (a matter which may be in dispute), the conclusion reached in the present opinion means that the extinction or otherwise of such an obligation will form part of the proof before answer at large. It is therefore unnecessary to consider trust matters at this stage. For the reasons given above, I propose that we allow the reclaiming motions; refuse the cross‑appeals; recall the interlocutors of the Lords Ordinary; in each case allow a proof before answer at large, all pleas standing; remit the cases to the Outer House to proceed as accords; and meantime continue any question of the expenses of the reclaiming motions and cross-appeals. In a separate Opinion, Lady Paton sets out the context of the two actions in which the liquidator of HC sues two firms of solicitors, LM and BP. Lady Paton considers in detail whether issues relating to prescription focused in the pleadings can be resolved without proof. I agree with her reasoning and decision which she sets out in her opinion. I have chosen to consider in some detail a different but connected issue which arises in the cross appeals on behalf of LM and BP as to whether there are sufficient relevant averments of any loss suffered by HC to go to proof. The factual averments in relation to loss made by HC in the actions against LM and BP are different but neither counsel for LM or BP submitted that any argument relied on by them depended on any factual averments, specific to one case, to distinguish the position of the respondents in relation to the averments of loss. In their submissions to this court, the challenge to the averments of loss was dealt with in oral submission only by counsel for BP. These submissions were also given prominence by counsel in the BP case when presenting the case to Lord Tyre. Counsel for LM adopted the oral submissions made by counsel for BP and the written submissions by counsel for LM were consistent with that. I consider, therefore, that this dispute can best be examined in the context of the submissions and pleadings in the BP case. Counsel for BP directed attention to Articles 5, 27A and 27B of the averments by HC. He submitted that there are express averments by HC that the sums loaned to various companies namely Bayhill, Brookhill, Hampsey and Bellwood were repaid by companies Mathon and Bathon during April and June 2007. Said sums were treated as repayments of said loans in HC’s financial statements. It is wrong to describe the repayments as “purported” as set out in the pleadings by HC. What is averred is not purported but actual payments. Relying on National Commercial Bank v Millars Trustee 1964 SLT (Notes) 57 and Capital Homes Ltd v Countrywide Surveyors Ltd  3 EGLR 153, counsel submitted that properly interpreted what is averred by HC is appropriation by HC and consequent extinction of the debt, that is, monies advanced in respect of the Bayhill, Brookhill, Hampsey and Bellwood transactions. Counsel also referred to Heather Capital Limited (in liquidation) v KPMG Audit LLC (unreported). He submitted in that litigation against the auditors of HC, there is an acceptance on behalf of HC that there was repayment. Counsel submitted that Lord Tyre erred in distinguishing the authorities of National Commercial Bank of Scotland and Capital Home Ltd on the basis that they were not concerned with fraudulent conduct. There are no averments by HC in relation to Mathon or Bathon’s involvement in any fraud. On the averments, any loss is the loss of Mathon or Bathon, not HC. Actual money in excess of 7 million was actually paid by Mathon and Bathon to HC and this equated to the sum released by BP from the client account. There are no averments that HC required to repay Mathon and Bathon and indeed any such requirement to repay would have prescribed. Counsel further submitted that the Lord Ordinary erred in drawing support for his conclusion from the fact that BP is being sued for damages and not repayment as this overlooks a major part of the case advanced by HC which is based on breach of trust for which HC are seeking repayment. The written submissions by counsel for LM pray in aid National Commercial Bank of Scotland Ltd and Capital Home Loans Ltd in support of the contention that the averments made are predicated upon a false proposition that HC never received any repayment of the sums it advanced to the company Westernbrook. It is averred that Cannons, solicitors on behalf of Westernbrook, repaid the sums in full and this was recorded in the books of HC. It is averred that HC delivered an executed discharge and the directors of HC took legal advice as to the entitlement to treat the funds received in that manner. Cannons received the money from a company Bathon. On the averments of HC, any loss suffered is a loss to Bathon as it was Bathon who made repayment on behalf of the company Westernbrook. It is further submitted that if the loss averred is a loss attributable to HC, it arises from the decision by HC to lend to Bathon which is not the basis of the action pursued against LM. Counsel for HC did not attempt in oral or written submissions to focus the issues in dispute about loss by reference to any detailed analysis of the pleadings. In relation to the criticisms about the averments of loss by HC in both cases, he submitted that Lord Tyre gave a correct and sound analysis at paragraph 20 of his opinion. He founded upon that. Lord Tyre correctly concluded that the cases relied on by counsel for LM and BP are distinguishable in that in both cases a complex fraud of a similar nature is averred by HC. Counsel submitted that both Lord Tyre and Lord Doherty were correct to reject the submissions that no loss had been relevantly averred by HC. Further specification of the allegations including alleged wrongful acts and omissions by BP, are set out in Articles 5-31 of condescendence. Article 5 sets out averments about loans, alleged to be fictitious, to Bayhill, Brookhill, Hampsey and Bellwood and the steps taken to create the false impression that the fictitious loans had been repaid between April and June 2007 by these companies. In Articles 27A and 27B there are specific averments about payments, using HC funds transferred from HC to Mathon and Bathon, to make “repayments due” from Bayhill, Brookhill, Hampsey and Bellwood. In relation to the averments of loss, in summary HC offer to prove inter alia; that HC money was paid into their client account at BP; a false impression was created that secured loans had been made to and repaid by four companies namely Bayhill, Brookhill, Hampsey and Bellwood; no money was paid out of the HC client account by BP to these companies; instead BP wrongfully paid in excess of £7 million without any security to a third party, Mr Levene; there are no averments by HC that any repayment was made by Mr Levene or on his behalf; there is a general denial of the respondents’ averment in answer 5 that the monies paid out by HC and forming the basis of the claim were in fact repaid to HC. In support of his submission that the pleadings about loss were irrelevant, counsel relied mainly on National Commercial Bank of Scotland and Capital Home Loans Limited. I do not consider that these cases support the submission made. The pleadings in both actions raised by HC are grounded in averments based on the relationship between HC and their solicitors, LM and BP. I am not persuaded that relationship equates to the relationship of banker (lender) and customer (debtor) and the special rules which may apply in such a relationship. In any event, even if the special rules do apply, it is difficult to understand how the principles relating to appropriation of debt payments in a creditor/debtor relationship have relevance to the averments in this case. I note that according to the averments, the creditor is HC and the debtor, who received the money, is Mr Levene; the Bayhill, Brookhill, Hampsey and Bellwood companies owed no money to HC as BP did not pay money to them but to Mr Levene; HC make no averments that the debtor, Mr Levene, repaid any money to HC or that anyone else repaid money on his behalf. I do not consider that the averments to the effect that payments to HC were credited as repayments by said companies to HC in the accounts of HC assist BP in their submissions. The context of the case pled by HC is to the effect that HC offer to prove that the “repayment” was a fiction as no sums had been paid to said companies Bayhill, Brookhill, Hampsey and Bellwood; said companies were not liable for any repayment; HC were unaware that further money borrowed from them by other companies (Mathon and Bathon)had been used to pay sums to them purportedly on behalf of secure debts owed to them by Bayhill, Brookhill, Hempsey and Bellwood. Further I consider that in both actions, where complex averments are made in the context of multiple transfers through different companies, I am unable to conclude on the pleadings alone, without evidence, that there is no loss. Whatever the basis of the claim made by HC culminating in Article 47 of condescendence, I consider that HC has made relevant averments of loss. I do not consider that the apparent concession in that case is without qualification and an acceptance that HC suffered no loss at all. In any event, I consider that a decision requires to be made on the basis of the pleadings by HC in the actions before this court. If there is an inconsistency in the position of HC and the liquidator, I consider that this is a matter to be explored in evidence and cannot be resolved at this stage. For the reasons given, therefore, I am of the opinion that Lord Tyre in the BP case and Lord Doherty in the LM case were both correct to conclude that HC had made relevant averments of loss and that the cross appeals should be refused.